It appears you CAN stitch Samsung Gear 360 images on a Mac without 3rd party software after all. The Samsung Gear 360 (reviewed here) remains the most affordable 4k 360 video camera on the market at the moment. However, it is compatible only with the latest flagship Samsung smartphones (S6 and above). – There’s a modified Gear 360 Manager app that can run on some Android phones. – You can use an iPhone to trigger the Gear 360 remotely. – You can trigger the Gear 360 remotely with the dedicated Bluetooth shutter. – You can use the built-in self-timer. However, the Gear 360 does not stitch its photos or videos in-camera. To stitch its images, you need the latest flagship Samsung smartphones or its included ActionDirector software (Windows only). Until now, the solution for stitching on a Mac was Autopano Video (299,00 € for the basic version). 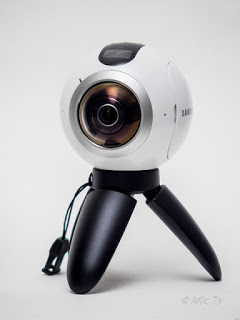 However, it appears that you can use a Mac to stitch Samsung Gear 360 images by using Bootcamp to install Windows then using the ActionDirector software. Some users have tried this and it didn’t work, but it did work for Jasper Schelfhout and his Macbook Air. Please note I don’t have a Mac to test, so this is unverified. I believe the key is the type of graphics processor in the Mac. ActionDirector requires Open GL 2.1 or above. To have Open GL, your graphics card must be capable of it, and there must be a driver for the OS that you’re using. For example, the Intel HD Graphics 3000 is capable of Open GL. However, on Windows 10, there are no drivers for it, so it can’t use Open GL. As a result, I can’t stitch Gear 360 photos with ActionDirector using a PC with Intel HD Graphics 3000. On the other hand, on Windows 7, there are drivers for the Intel HD Graphics 3000 (need to update the driver first), so I’m able to stitch both photos and videos. For Mac users, it appears you MAY be able to stitch Gear 360 photos and videos on ActionDirector running on bootcamp IF your graphics driver supports Open GL. Here is a list of supported Operating Systems for Intel Graphics. If the processor has Intel HD Graphics 4200 or later, it ought to work in Windows 10 (may need to update the driver). 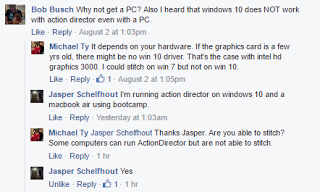 If it’s Intel HD Graphics 2500 or 4000, it might or might not work on Windows 10. If it’s HD Graphics 2000 or 3000, it won’t work on Windows 10, but it will work on Windows 7. Interesting! So I've tried using Bootcamp to use Action Director on a Mac, but get a weird section in the middle of the front lens that is just black pixels in the stitched version, like there's no information there. Anyone run into this issue?